Those joining us on the Saronic Route in Greece will have a good idea of their culinary week ahead just by looking out of the window on their journey to Lavrio Marina - the only trees you see are centuries-old olive trees. If you want to make the most of your Yacht Week you will need good food, very good food. Greece is an intense and thrilling route, you will spend your days sailing, enjoying the sea, meeting new people, and your nights partying until sunrise. The Yacht Week organise for you the best restaurants every night so you can taste foods made by traditional Greek chefs with naturally grown local ingredients. 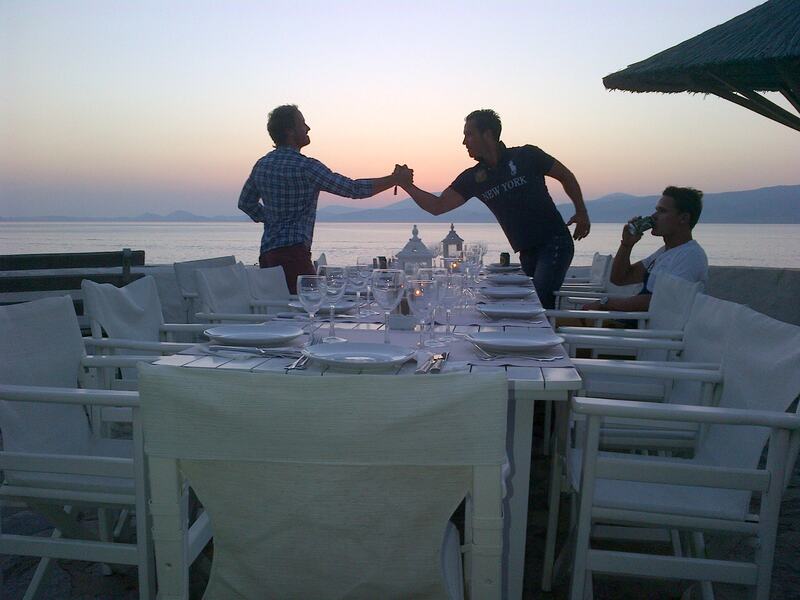 [margin10]The BEST restaurant of the route: the sunset in Hydra! 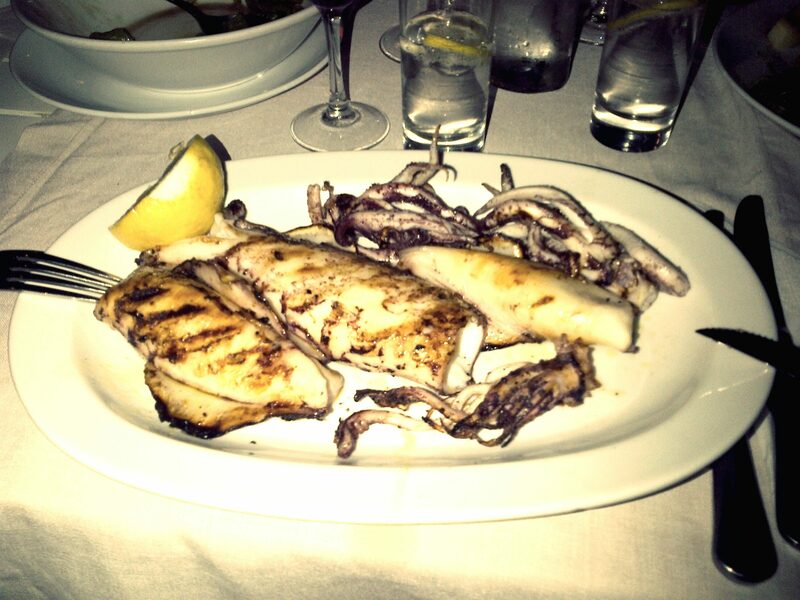 Here three Hydra grilled squids. Fish and seafood are everywhere. In Poros, the first island, we were lucky to enjoy kalamarakia (squids fried in batter) and grilled barbounias (red mullet) for five of us, probably one of the best fish you will ever taste. Many more options are available: shrimp, sardines, mussels, octopus, lobsters... and all local! 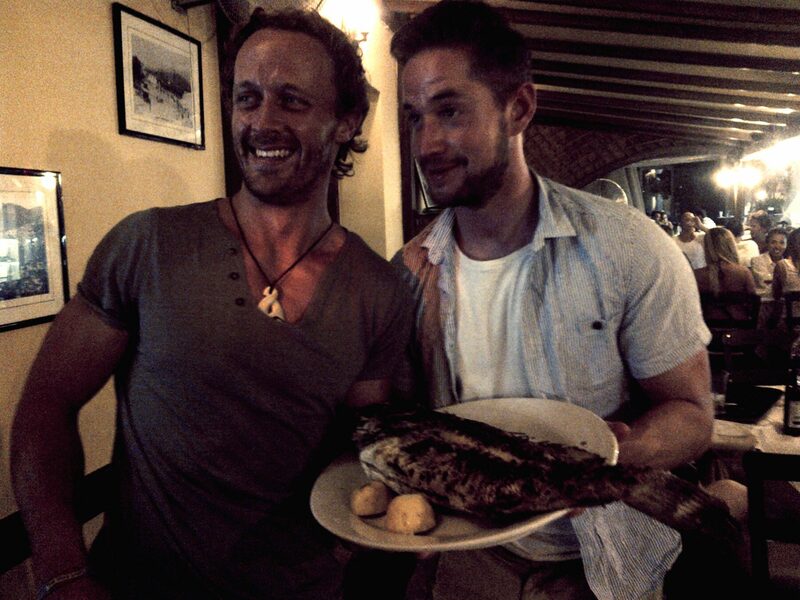 [margin10]Glen and Max in Oasis Restaurant, Poros: "Want some big fish?" Greek food is also to be enjoyed everyday on your yachts: you will never find a better honey to pour in your Greek yogurt for breakfast, or pitta to dip in your tzatziki and tarama for lunch. 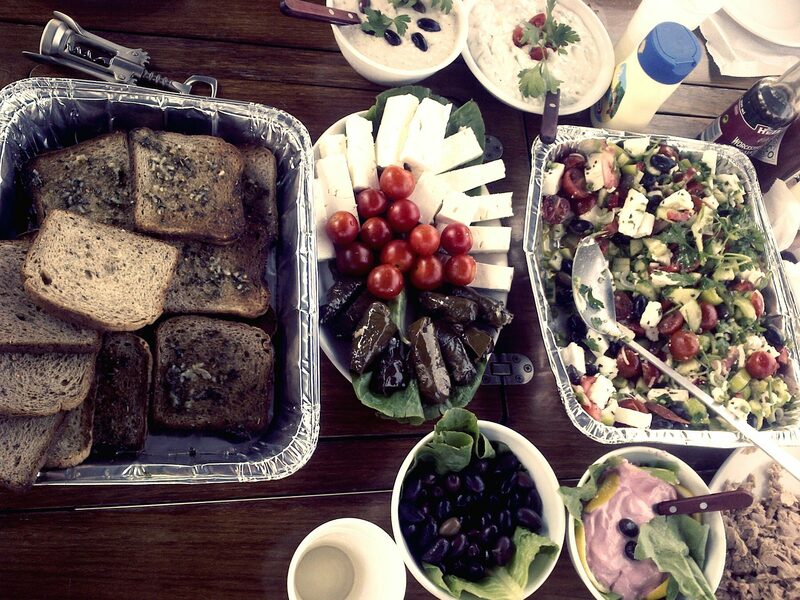 [margin10]Garlic bread with herbs and olive oil, tzatziki (yogurt and cucumber), tarama (fish eggs), aubergine caviar (eggplant), marinated olives and Greek salad: the perfect on-board (recovery) lunch. 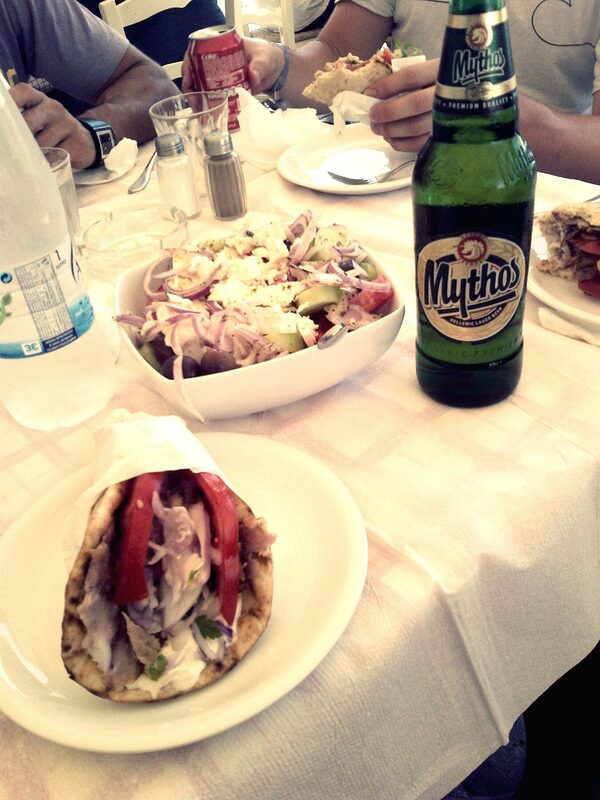 [margin10]Foods for the fast: Gyros, roast chicken, lamb or pork slices and Greek salad wrapped in pitta bread with tzatziki, also available in the souvlaki version (grilled on skewers), best enjoyed with a Mythos local beer. [margin10]A Boutari Moschofilero, bold and fresh P.D.O. 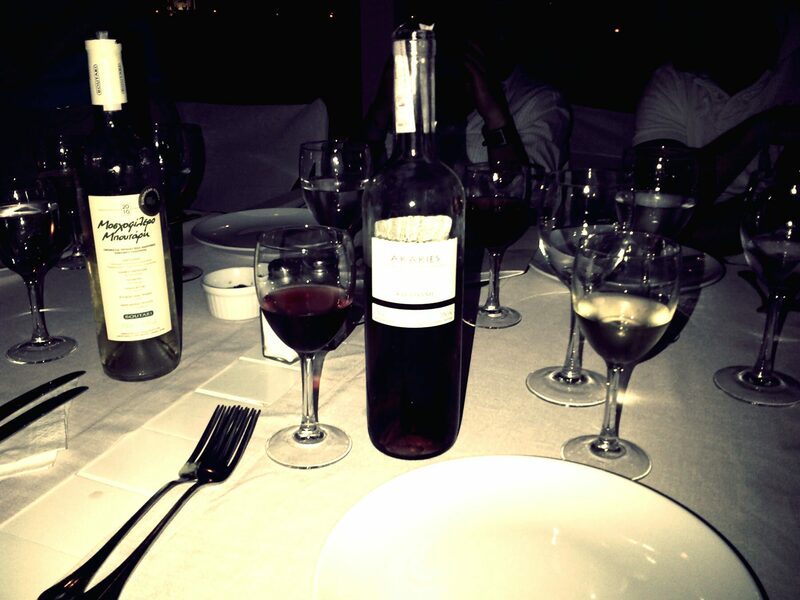 white wine from central Peloponneses and a Kir Yianni Arakies rosé (Xinomavro grapes) from Amyndeon, northwestern Greece, the only Greek P.D.O. rosé. 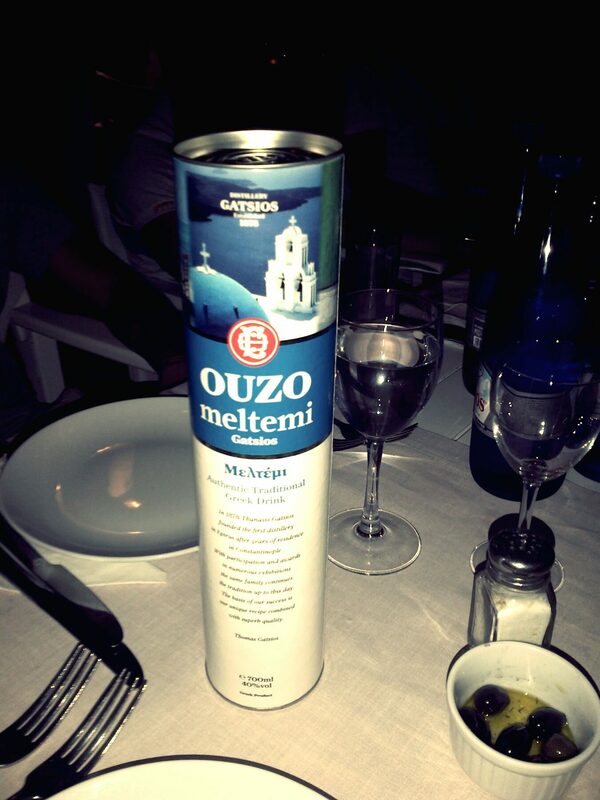 [margin10]Ouzo is a symbol of Greek culture whose exact recipe is secretly kept. This liquor, invented by monks, is made of star anise, coriander, cloves and cinammon and can be drunk "milky white" diluted in chilled water (equal parts) or straight in shot glasses. Don't worry, in Greece there's absolutely no need for planning, there will be spontaneous and unexpected food experiences along the route. Just do like the Greeks: relax, enjoy and party!